In this special installment of Collider Kids, our weekly family-friendly article that puts the spotlight on content for our younger viewers, we talked with Ready Jet Go! 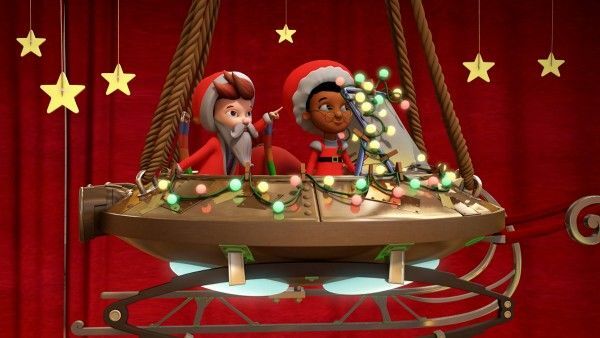 creator Craig Bartlett (Hey Arnold!, Dinosaur Train) about the science-focused PBS Kids show and its upcoming holiday special. Ready Jet Go! : Holidays in Boxwood Terrace will launch on PBS KIDS this December 11th (check local listings). 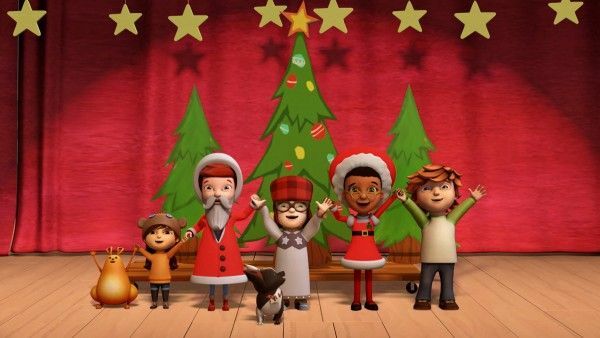 The merry and bright special will also be available to stream for free beginning that date on pbskids.org and the PBS KIDS Video App, and fans can check it out via the 24/7 PBS KIDS Channel as well. 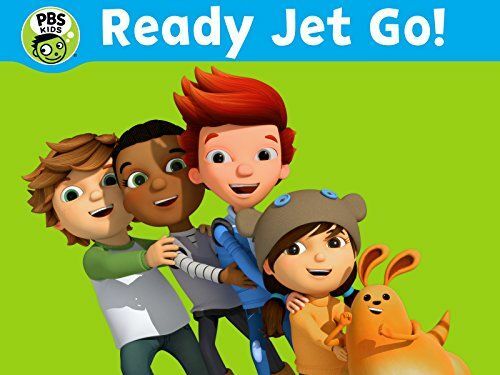 For people who aren’t familiar with Ready Jet Go!, how would you describe it? Craig Bartlett: I would say it’s a kids-first space show. It’s about an alien kid who comes to live in the neighborhood, so in the cul de sac you have this guy from outer space. They’re all really huge fans of the Earth; Jet and his parents, they think it’s the greatest. So kids who are watching, I hope they get an idea of how great the Earth is from watching Jet say how great it is. Basically, they keep going out into space and looking back at the Earth, and that’s my favorite message to kids: Once we see the Earth from space, we realize how precious it is. How did Ready Jet Go! come about? What makes PBS the perfect place for Ready Jet Go? Barlett: I had done Dinosaur Train with Linda, and I felt like we were really in sync. We made 89 episodes of Dinosaur Train now, and I realized, “I can do a science show!” All you have to do is make sure that the subject matter of your curriculum is something that you really love, and I really love dinosaurs and I really love space. It was an easy fit. Bartlett: I think the space piece is interesting because it really does represent that frontier of our ability to accomplish things. The things we do when we send probes out into space and navigate them around planets, bringing back the most beautiful photography that I can think of … The new pictures from Juno, of Jupiter’s surface, are perfect examples of that. And there’s something really impressive to me about the engineers and scientists who create those machines, and they get out there and perform these maneuvers that are all about amazing math … even though math isn’t even my thing, I still have this appreciation for how beautiful an endeavor that is. I love that kids, just from watching a science show, they learn to be critical thinkers, they learn to apply things like the scientific method to problems, I just think that makes for more responsible citizens. They’ll grow up to be able to find the difference between fact and fiction, and just be investigative and ask questions, all that stuff. We try to model that in our characters. Jet is, as an alien, just running around, super curious about everything; he’s not super-critical, he’s super-curious. That’s why there are several characters: Sean is the one going, “Wait, wait, wait, we have to be scientific about this.” And Sydney’s creative and using her imagination. And then Mindy, the fourth character, is just meant to represent real four-year-olds. [laughs] In Season 2, she turns 5. We had a running gag where once she turns 5 she can go to space, so we send her into space in Season 2. Bartlett: So great. On Dinosaur Train, we worked with Scott Sampson, who is a paleontologist who basically tells you what’s new in paleontology. Amy is that for us, too. Every time we sit down for a bunch of shows, we go, “Amy, what’s new in space?” She loves that things that they just discover wind up on the show. She calls it bleeding-edge science, where if they make a discovery about an asteroid, or discoveries about Pluto–both Amy and I are big fans of Pluto, we just like it because it’s small and cute, and of course got kicked out of the planets. We wanted to do a story, but we knew that it’s been three years since New Horizons went by. However, when we were writing our Pluto show, she said, “Wait, hold on. Let’s not really start that one until New Horizons goes by.” So we got all that information and put it right into the episode. That aspect of it’s really fun. It’s the same with Dinosaur Train, too. 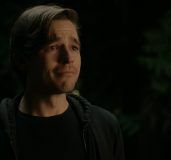 Scott Sampson made a new discovery one summer, and in the fall, that was a character in the next episode. That stuff is really fun. They’re finding brand new stuff and we get to include it in our show. And Amy’s just incredible. She’s very creative, has a great sense of humor, and she shoots those live-action interstitials for us. Her day job is managing teams who look at space telescopes, and they’re tracking near-Earth objects and looking at the asteroid belt and that kind of stuff, and she says there’s a lot of running numbers in that job, so she loves to take a break and work on our show. She pours a ton of energy into advising us on all this science. It’s the best; I can’t think of anything cooler. Bartlett: Amy’s personal story is that, as a kid, she became interested in astronomy. 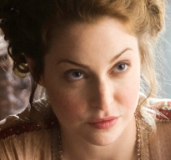 The people in her life who were authority figures basically encouraged her. She wants to be able to give that encouragement to little kids, especially girls. You have girls who, by the time they get of an age in science, it’s sort of becomes a boys’ thing and the girls drop out. She’s working on that. We’re working on that all together trying to model a real gender-balanced show where everybody loves space, and the girls and the boys, there’s no difference as far as their interest and thinking they can be scientists. What can you tell us about “Holidays in Boxwood Terrace” special? 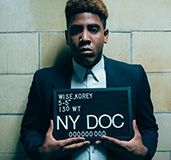 Bartlett: By the time we got to that one, that was at the end of our first two seasons worth of shows, so we were like, “Well, we have to do a Christmas special. That’ll be great!” It was fun to have done it that long. We’ve had several episodes where Jet kind of puts on a show. Truly, one of the foundations when I pitched it was that Jet is kind of a Music Man. Jet is this little alien kid but he’s kinda dancing around like the Music Man with his elbows out, marching around, and he’s always ready to burst into song. That aspect where Jet, he’s kind of irrepressible–you can’t keep him from starting a show–and by the time we’d gotten to the Christmas show, we had already done several of those. So the Christmas special is kind of meta. Jet’s like, “A Christmas pageant? What’s that? Great! Let’s go look at it!” He immediately goes downtown and finds Mr. Petersen, who’s one of the DSA guys, and he can’t wait to hand over the directorial reins to Jet; he’s been doing it for years and he’s exhausted. Jet comes in with a whole pitch sequence and Petersen can’t wait to give it to him. So now you have Jet, the alien kid, directing a Christmas pageant. It’s such a runner that the Propulsion family basically takes words really literally and don’t really understand English that well, in a classic sci-fi comedy tradition. The aliens have always been that way. They’re particularly good-natured, our family of aliens is particularly sweet. They have a really short-term memory and the next day they’re ready to start all over again. They never lose their enthusiasm for this new planet. All my favorite things about Jet, we put into the special. I got to write a bunch of songs. It was really important that the Christmas special have a story, and the story is that Jet gets to put on the pageant, but in order to put on the pageant, he has to find out what the spirit of Christmas is, and so he hires Mitchell–the loner kid who’s the detective who always spies on them–to help him find the spirit of Christmas. What you realize is, when Mitchell takes the job, is that as a loner he wishes he could fit in but doesn’t know how. Of course, the whole pageant is going to lead to a scene with a song about the spirit of Christmas being about letting someone in. “There’s someone out in the cold, let them in.” Mitchell gets to experience that and literally discover in real time that he’s being invited in. Bartlett: I hope so. I really like that. I think that’s the nicest thing about the holiday shows. I totally hope it’ll be a perennial and that people will watch it. 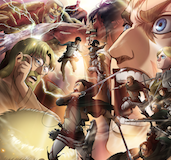 I hope that the show gets to go on so we can make more in the future. What’s the future for Ready Jet Go? Bartlett: A show like Ready Jet Go! could probably go on forever because that element of new discovery will always be there. I hope we can keep going. It’s always a challenge. 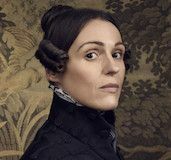 If PBS considers it something that they can grow into a classic property, that would be fantastic. We are very hopeful, and ready, to do a Season 3 of Ready Jet Go! Ready Jet Go! 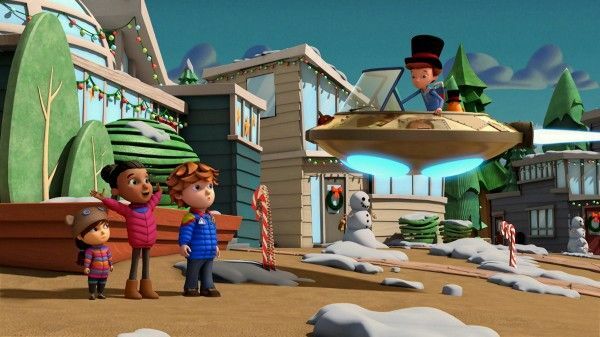 : Holidays in Boxwood Terrace will launch on PBS KIDS this December 11th (check local listings). 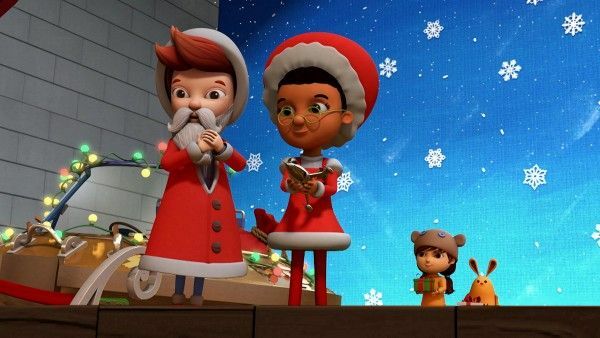 The merry and bright special will also be available to stream for free beginning that date on pbskids.org and the PBS KIDS Video App, and fans can check it out via the 24/7 PBS KIDS Channel as well. And keep an eye out for new Ready Jet Go! merchandise, books, and toys in 2018! • Collider Kids • Craig Bartlett • Interview • Mouseketeers • PBS • PBS Kids • Peppa Pig • Ready Jet Go!